NBC has renewed Hollywood Game Night for a fourth season. The new episodes will kick off on Tuesday, January 5th. UNIVERSAL CITY, Calif. – Dec. 2, 2015 – NBC’s popular party-time series “Hollywood Game Night” is set to return for its fourth season on Tuesday, Jan. 5 at 8 p.m. In the WGA Award-winning series, two contestants are transported from their everyday lives into a magical once-in-a-lifetime night of fun and celebration as they step beyond the velvet rope and rub shoulders with some of their favorite celebrities and compete for the chance to win up to $25,000. Jane Lynch, who has won the Emmy Award two years in a row as outstanding host for a reality or reality-competition program, will once again lead the on-screen festivities. A slew of high-profile actors, athletes and recording stars will participate in the fun as they compete in hilarious party games. Celebrities include Oscar winners Geena Davis, Mira Sorvino and Helen Hunt; TV stars Eva Longoria, Kate Walsh, Taye Diggs, Tony Hale, Laverne Cox, Miranda Cosgrove, Ryan Eggold, Ta’Rhonda Jones, Bellamy Young, Ben Feldman, Lea Thompson, Marlon Wayans and Mario Lopez; recording stars Ciara, Hunter Hayes, Melissa Etheridge, Estelle, Kesha, Tyler Hubbard and Brian Kelley of Florida Georgia Line; and athletes/sports personalities Abby Wambach, Al Michaels, Chris Jericho, Tara Lipinski, Apolo Ohno, Nate Burleson, Maurice Jones Drew and Rich Eisen. Last summer, originals of “Hollywood Game Night” averaged a 1.5 rating, 5 share in adults 18-49 and 5.3 million viewers overall, for gains of +25% in 18-49 and +20% in total viewers versus its averages for originals the prior summer (1.2 in 18-49, 4.4 million viewers overall), according to “live plus seven day” results from Nielsen Media Research. In its Tuesday 10-11 p.m. ET time period, “Hollywood Game Night” ran undefeated last summer versus regular ABC and CBS competition in adults 18-49. 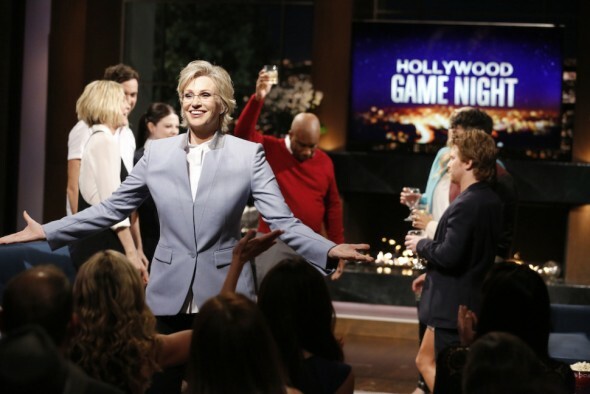 “Hollywood Game Night” is produced by Hazy Mills Productions (“Grimm,” “Crowded,” “Hot in Cleveland”), Mission Control Media (Syfy’s “Face Off”) and Universal Television. Sean Hayes, Todd Milliner, Michael Agbabian, Dwight D. Smith and Michael Binkow are executive producers. What do you think? Do you enjoy Hollywood Game Night? Will you be watching the new season?